Listening to short stories is an effective and fun way to learn French! 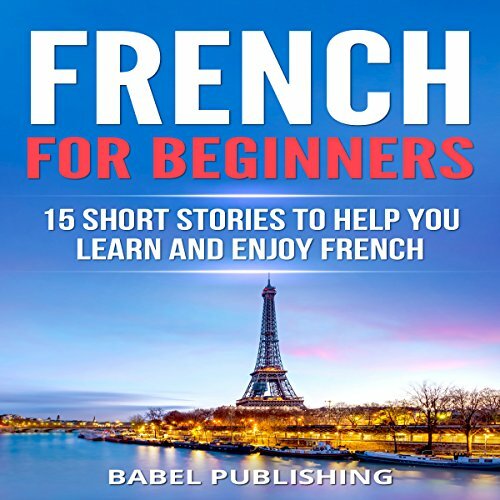 Improve your listening skills, learn new French vocabulary and expressions, discover interesting French cultural facts, and enjoy yourself whilst reading these 15 engaging, original stories in French. This audiobook is ideal for beginners, new learners, and anyone who wants to brush up on their French skills. Our short stories are perfect to be listened to anywhere and anytime, perfect to fit in a busy lifestyle. They can be listened to in one sitting, allowing you to focus on the story and the new vocabulary without getting discouraged. In these stories, you will meet an array of engaging and colorful characters navigating real life situations: the purchase of a new dog, a movie night, an anniversary, a birthday surprise, a holiday between friends, or simple everyday family situations. All stories are created using simple vocabulary you can use during day-to-day conversations in any French-speaking country. At the end of each story, a listening comprehension section and a quiz will allow you to go further and expand your knowledge. Learn and remember hundreds of French words, phrases, and expressions you can then use in real-life situations. Improve your general French listening comprehension skills. Get a sense of how French language is used in normal, everyday situations and learn useful vocabulary you will be able to use next time you visit a French-speaking country! Familiarize yourself with many grammatical structures without having to memorize any rules. Learn in a fun way: listening to our stories will not feel like you’re studying. Experience language learning from an entirely different point of view. So don't hesitate. If you want to learn French the fun way, now is the time. Just scroll up and download your copy now!